Pop music and American film have gone together hand in hand for some time now, from the MGM musical era, to the titular pop hits of the 80s, to the power ballads of the 90s. However, the last decade has seen the disappearance of the iconic movie soundtrack. Unless it’s a musical or an animated film, that toe-tapping number you always associated with that one movie died at the turn of the century. The value of a musical soundtrack to a film began back in the 1920s and the early days of sound film with The Great American Songbook, represented primarily through movie musicals. The heyday of MGM musicals, Ginger Rogers and Fred Astaire, and film versions of Broadway shows, were the foundation for audiences’ introduction to hit tunes. This trend continued through the 1950s but by the late 1960s and 70s, the movie soundtrack was reinvigorated by the era of New Hollywood cinema (also referred to as the American New Wave movement). Particularly, it was New Hollywood’s anti-establishment streak that lent itself to use of rock music in movies. Suddenly, films like The Graduate, Easy Rider, Mean Streets, American Graffiti, Harold and Maude, and Saturday Night Fever, were putting previously published popular music to work, in many cases, as defining parts of the film, not simply a soundtrack but a vital part of the story being told. The movie soundtrack dynamic dramatically changed again during the next decade. For 80s movies, It wasn’t just popular music being ascribed to films, but rather, music was specifically being tailored to and written for movies as themes. The soundtrack became part and parcel of a film’s production, partly as a way to help market the film, but also, to drive soundtrack album sales. Look no further than the fact that many of the most popular songs began sharing their titles with that of the films for which they were the theme. And, with the explosion of MTV and cable, movie theme songs also allowed music videos to function as little more than extended trailers. Just think of songs like Huey Lewis and the News’ “Back In Time,” for Back to the Future, Kenny Loggins’ “Footloose,” Cyndi Lauper’s “The Goonies R Good Enough”, Oingo Boingo’s “Werid Science,” and Ray Parker’s “Ghostbusters.” None of these tunes were more iconic, though, than Huey Lewis’ contribution to Back to the Future, and Kenny Loggins, who takes credit for the iconic themes to three successful feature films, Top Gun, Footloose, and Caddyshack. 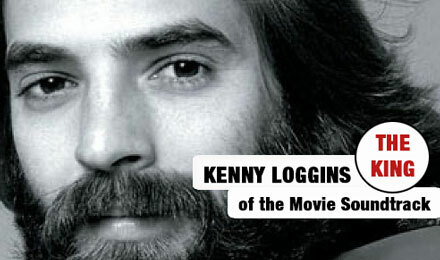 It was Loggins who, in fact, was crowned the King of the Movie Soundtrack, because of the proliferation of his tunes across multiple movies of the 80s. One can’t simply remember Top Gun without also recalling his hit tune, “Danger Zone.” While Loggins music career extends far and beyond his songs for movie soundtracks, it was those songs that became instilled in the cultural memory, as part of the nostalgia for a period of movies. His first movie soundtrack theme song was Caddyshack’s “I’m Alright,” which made it to #7 on the pop charts. Next was the titular theme, “Footloose,” which topped the pop charts and was followed by “Danger Zone,” which made it to #2 in 1986. He cracked the charts again writing “Meet Me Halfway,” for Sylvester Stallone’s Over the Top, and it didn’t stop there, as Caddyshack II brought him back to write “Nobody’s Fool,” which reached the top 10 in 1988. But all his original songs in the 80s were just a primer for him to write “For the First Time” for the One Fine Day soundtrack, for which he would earn an Oscar nomination. If one thing is clear from this, it’s that 80s movies were ripe for big name musical acts to get paid to put their imprimatur on a film through singing (or composing) an original theme or songs for film soundtracks. Yet, it didn’t end there, the movie theme song continued well into the 90s. The 90s tunes were slightly different from the 80s incarnations, gone was the pop/rock mainstream substituted almost exclusively for the power ballad tunes like Celine Dion’s, “My Heart Will Go On,” for Titanic, or Whitney Houston’s “I Will Always Love You,” for The Bodyguard, Aerosmith’s Armageddon theme, “I Don’t Want to Miss a Thing,” Seal’s “Kiss from a Rose,” in Batman Forever, and who could forget the triple-hitter that was Bryan Adams’, Rod Stewart’s, and Sting’s “All For Love,” for Disney’s The Three Musketeers. Yes, the power ballad defined the movie theme song for much of the 90s, and it was good, but if only that were the extent of it. Unfortunately, the late 90s also brought us the hip-hop infusion of Big Willie Smith, the man who can be credited with killing the movie theme song with two ludicrous, but wildly popular at the time, tunes, “Wild Wild West,” and “Men In Black.” Criticized for both sampling a Stevie Wonder song and for the incongruity with the western setting of the film, for which it serves as the theme, “Wild Wild West” also managed to win a Golden Raspberry Award for Worst “Original” Song of 1999. Of course, this followed Smith’s Grammy Award in 1998 for Best Rap Solo Performance for “Men In Black,” you can’t win ‘em all but you can win some of ‘em. While we can’t single-handedly credit Big Willie for the death of the iconic movie theme song, it curiously, and maybe not coincidentally, began disappearing right around the same time. In the 2000s, the movie soundtrack became a different animal altogether. Gone were the power ballads and the pop hits from mainstream headliners, swapped instead for songs from independent bands and smaller labels, the indie/folk scene took root first in the soundtrack of small films before topping charts like they do today. Let’s call it the Garden State-effect, wherein, like 70s New Hollywood cinema, previously published songs once again became the source for movie soundtracks, only this time it was less well-known bands and songs that populated the tracks. The trend can be tied in part to the decline of the music industry, the result of digital distribution, as much as general cost-cutting in Hollywood productions, but big name artists writing mainstream hits became cost prohibitive, while picking up a full album of independent artists to craft a soundtrack became the cost-effective norm. Additionally, television took up the mantle of using Top 40 indie, folk, and pop hits to drive their soundtracks. It all of sudden became more common to hear the same indie hits on Grey’s Anatomy that you’d hear on the radio. A fair bit of this can be attributed to the Glee­ music boom, where artists that licensed their songs cheaply, or sometimes for free to a TV series, would see corresponding sales spike on digital distribution outlets. But after the decline of the music industry’s album-centric model, in the age of digital distribution, singles flourish. And with the mobile app era in full swing, audiences could Shazaam those ear-catching tunes, find the artists, and then download the single in a matter of a few swipes, making the legal consumption of music far easier than it had ever been in film history’s Golden Age of iconic theme music. Like it or not, the film industry clearly abandoned tacking obligatory songs onto their summer blockbusters for the time being. That isn’t to say that this will remain the norm, but for now, top hit songs are almost exclusively the providence of television, while smaller films still utilize previously published music to make a soundtrack that serves the film, even if the music isn’t produced strictly for the film. 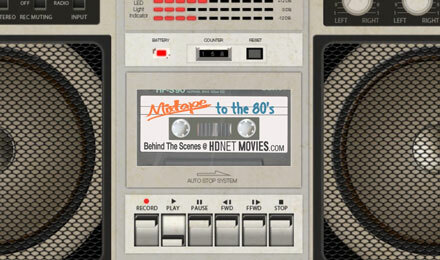 But unless it’s a Bond movie, or an animated Disney flick, the iconic movie theme song is of a bygone era, which is why this month we celebrate our nostalgia for the Mixtape to the 80s .